Here is a play as full of thrills, daring escapades, dramatic struggles, and surprises as a baker's dozen of melodramas of nowadays. 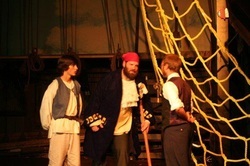 Treasure Island is an adventure tale, but it is also the story of one boy’s coming of age. At the outset of the novel, Jim is a timid child, but by the end he has matured incredibly. He has outwitted pirates, taken over a ship, and saved innumerable lives. Jim has become an adult in character if not in age. Like any maturing boy, Jim must try out various male role models.